WINNERS: Brad Pavey, Peter Eberle, Anne Way and Matt Flapper from the victorious Ocean Grove Blue side. The culmination of the second season of the newly formed association’s Pennant competition saw Ocean Grove Blue prove too strong for Leopold Green in the grand final on Monday night. Ocean Grove’s Brad Pavey along with Peter Eberle, Anne Way and Matt Flapper powered to a 20-10 win against the Leopold team skipped by Douglas Thompson. A healthy crowd of approximately 60 spectators converged to Marcus Hill Hall too witness two class finals played to a high standard. The consolation event played adjacent to the major final was won by Drysdale with Nick Lazic, Keith Bridgeman, Danny Williams and John Fry finishing ahead of St Leonards foursome skipped by Dean McNeil. 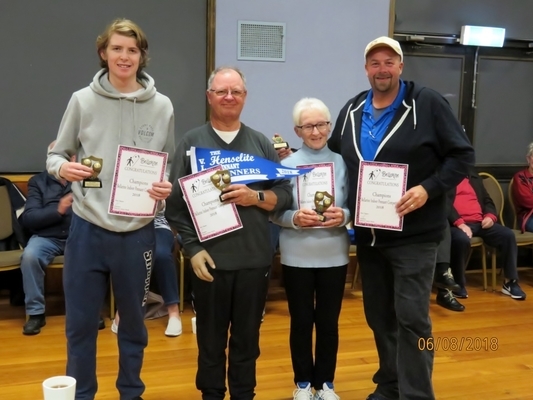 Presentations were made to the premiers as well as the Bellarine Champion of Champions singles winners Patricia Virtue and Ian Robinson. Congratulations to all involved in this seasons competition, five clubs, 102 registered players, 18 teams has certainly laid the platform for the competition to grow into 2019. Ocean Grove U18 star Kira Bourke has been given the opportunity to defend her crowns in the Australian U18 Championships which will be held October 2-5 at the Capalaba Bowls Club in Brisbane. Selected to play singles and skip the triples in exactly the same events as she dominated in 2017. The only difference will be the triples line up which will include nationals debutantes Amity Bickley from Mulgrave Country Club and Olivia Cartwright from Kyabram. A healthy boost of new blood will take to the greens in season 2018-19 for Ocean Grove Bowling Club. Over 25 new members which include current and past state representatives as well as new bowlers have joined the ranks to tackle this season’s Saturday and Midweek Pennant competitions. Welcome aboard to all new members and we wish you all the best in the Grove shirt.